This week's SHOPPING OUR STASH challenge is "Splish Splash" we'd like you to use wet media... spray inks, watercolors, acrylic paint, india ink, water soluble crayons, etc...in any way at all, either as a background or with stamps as a focal point or... whatever. I admit this challenge put the fear into me...I don't like to colour, OK that's not totally true...I do like to colour...but my colouring skills are SHITE! However...I hope I made my SOS teammies (and fantastic colour-ers) JESSI and CHRIS proud...I water coloured....and I enjoyed it...and it doesn't look like total shite!!! YAY me!! I used Tim Holtz' tutorial for the June 2014 tag to make the background, inking up the reverse side of the stencil with distress inks, spritzing it with water, applying to the watercolour cardstock and drying with the heat tool. I inked the edges and went over the white areas of the background with Frayed Burlap distress ink to "vintage it up" a wee bit. 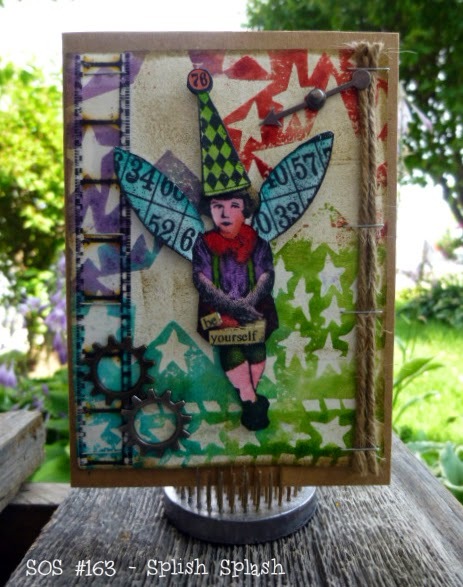 I used Tim Holtz' watercolour pen with the same distress inks to colour the image, I doubled up on her hat, wings and "be yourself" to give it some dimension. Be sure to visit the SOS BLOG for all the details on the Splish Splash challenge and while you are there don't forget to show my teammies some crafty love!! This is sooooo freakin awesome, Donna! I just can't love it enough! You ROCKED coloring the background and that image! OMG! Fantabulous! Fabulous!! I love how you created that background and I might have to give that a shot one day! I love her wings and hat, and the "be yourself" sentiment is perfect! Awesome, see you can colour like the pros. Love the bright pops of color on this vintage style card, Donna! Great contrast! This is FAB-U-LOSO! I love it!